factors. Some of the economic challenges faced by farmers include reduced profitability of some current cultural crops due to competition and/or lack of proper skills to manage their farm finance. Environmental factors affecting sustainability in New Mexico include declining water resources, weather uncertainties and increasing seasonal temperatures. There is a need to develop strategies to sustain rural economies in New Mexico in the face of all these challenges. Another area of need among farmers in New Mexico is the appropriate use of cover crops. Cover-cropping has been shown to save water, increase crop yields, and can build resiliency into the farming systems of the arid and semi-arid regions. Growers and agricultural professionals have been asking several questions related to suitability of different species as cover crops and cultural practices that are needed to successfully include these cover crops as part of their rotation. To address some of these needs, we propose to have a single-day NM WSARE Conference focused on enhancing farmers’ sustainability. This conference will address issues such as new and high value crops for New Mexico, farm financial management, profitable crop rotations and benefits/profitability of combined animal and crop husbandry. participants on the practical aspects of cover cropping. Past NM WSARE conferences have been well received among agriculture professionals, educators and farmers, and past evaluations have shown increases in knowledge gained by participants. We hope to build on the past successes of NM WSARE conferences, to deliver appropriate and timely information on strategies that can enhance sustainability of farms in New Mexico. aspects of cover crops. We also plan to invite at least two cover crop experts to participate in the Farm Walk, to help answer participants’ questions. advisory committee to attend these events. Part of funding will also be used to bring appropriate resource persons to present at the proposed events. Idowu & Stephanie Walker). The State coordinators will be responsible for scheduling meetings of the advisory committee whenever needed. The NM WSARE Advisory Committee will be responsible for identifying sustainable agricultural issues that are relevant to New Mexico, and for planning the yearly activities agreed upon by the committee members. Specific inputs of the advisory committee would be to identify suitable location for proposed events, selecting appropriate speakers, developing agenda for programs and planning other program logistics. sustainability. We also plan to have a discussion session during the conference, that will facilitate interactive engagement between participants and resource persons. The NM WSARE conference will be held in Los Lunas while the venue for the Farm Walk is not yet certain. The advisory committee is still working on the selection of an appropriate location for the Farm Walk. The Farm Walk is expected to take place in another region apart from Los Lunas axis, to provide opportunity for additional participants who may not be attending the NM WSARE Conference. The Farm Walk is expected to take place in the summer, while the conference will take place in the fall. All the presentations during the conference will be hosted on the NM WSARE website (http://aces.nmsu.edu/programs/sare/index.html) and the link to the website will be actively promoted through press releases and other appropriate media methods. Farmers in New Mexico have continued to face intense pressure due to increasing challenges associated with economic and environmental factors. Some of the economic challenges faced by farmers include reduced profitability of some current cultural crops due to competition and/or lack of proper skills to manage their farm finance. Another area of need among farmers in New Mexico is the appropriate use of cover crops. Cover-cropping has been shown to save water, increase crop yields, and can build resiliency into the farming systems of the arid and semi-arid regions. Farmers and agricultural professionals have been asking several questions related to suitability of different species as cover crops and cultural practices that are needed to successfully include these cover crops as part of their rotation. There is a need to develop strategies to sustain rural economies in New Mexico in the face of these challenges. To address some of these needs, a single-day NM WSARE Conference focused on enhancing farmers’ sustainability was organized. This conference addressed issues including alternative/new and high value crops for New Mexico, farm financial management, farm marketing strategies and feasibility of cover crops in dryland farming systems. In addition, a farm walk was organized focusing on sustainable management in a small-scale organic farm with diverse crops. The farm walk engaged participants on the practical aspects of cover cropping, irrigation, pest control and greenhouse management. Green tractor farm is a certified organic farm since 2000, growing certified organic vegetables, flowers and grapes on 3 acres, practicing different water conservation methods and soil building strategies in a high desert climate. They market their products at the Santa Farmers’ Market, at La Montanita Co-op and to local restaurants. The Farm Walk focused on addressing issues like crop rotations and cover crops for building soil health, greenhouse systems, pest problems in vegetable production and irrigation water management. 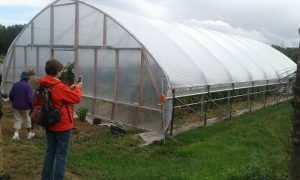 One of the unique features that attracted the attention of the audience was a moveable greenhouse on rails that can be used to manage different parts of the field. 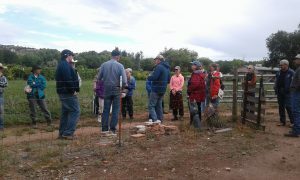 About 40 people attended this farm walk. A pre- and post-survey was conducted to assess the knowledge gained by farm walk participants. Question in the survey were designed to find out the knowledge gained on cover crops, crop rotation, pests, disease and irrigation management. Results of pre- and post-surveys for the farm walk indicated a gain in knowledge of about 41% on cover crops and 16% for crop rotation. However on the other issues, knowledge gained was negligible and generally less than 4%. Over 90% of the participants indicated that the knowledge gained during the farm walk will be applicable to their production practices and would try at least one of the practices that they learned during the farm walk. 100% of the participants indicated that their expectations were met and would want more information about some of the topics discussed during the farm walk. To train agriculture professionals, farmers and stakeholders in New Mexico on how to enhance farmer sustainability. The NM Sustainable Agriculture Conference focused on enhancing farmer sustainability in New Mexico. Topics covered during the conference included the presentation given by Jim Freeburn on “Sustaining America Agriculture: What We’ve Lost and Opportunities”. 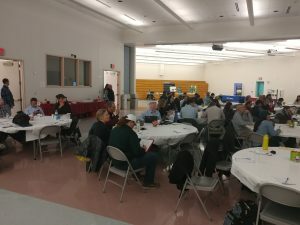 Part of the conference focused on farm economics, and topics covered included the importance of farm record keeping and produce marketing strategies. The afternoon session of the conference focused on possible alternative/industrial crops for New Mexico in light of the challenging farm economics. Topics covered included Guayule as a source of natural rubber and guar for industrial production. Other presentations during this conference focused on canola and Papa Criolla potatoes. One of the unique aspect of the conference was the introduction of students poster competition. This led to a good participation of students in the NM Sustainable Ag. Conference and enabled the students to meet with agriculture professionals and farmers. Close to 20 students attended the event and presented their posters focused on sustainable agriculture which attendees had opportunity to view during the breaks. From the pre- and post-surveys conducted during the NM Sustainable Agriculture Conference, very high gains in knowledge were recorded for topics related to alternative/new crops ranging from 77% for guar presentation to 173% for Papa Criolla potatoes presentation. Informal contacts with some agricultural professionals indicated a strong interest in producing alternative crops in New Mexico that can enhance farm profit. Due to this conference, two extension educators decided to join the advisory board of a newly funded USDA/NIFA grant project (Sustainable Bioeconomy for Arid Regions) focused on production of guayule and guar in New Mexico. During 2017, the NM PDP Co-Coordinators attended to several questions either by email or through phone calls (about 10 emails/phone calls) from persons interested in submitting WSARE grants. Press releases were sent out to inform stakeholder about WSARE grants and respective application deadlines and to publicize the New Mexico Sustainable Agriculture Conference and Farm Walk. Many SARE publications were shared with interested stakeholders. A WSARE information booth was also hosted during the NM Organic Farming Conference held on February 17-18, 2017.